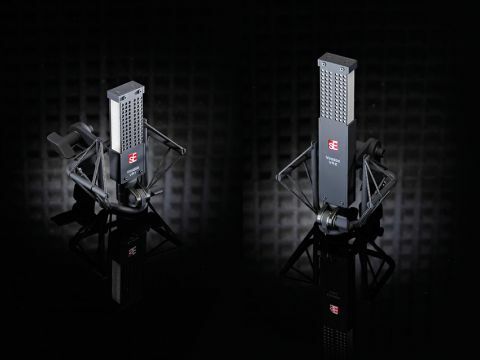 A unique and impressive update to the ribbon mic that out-performs many in the £1k range. Excellent ribbon/condenser hybrid frequency response. Small and light makes them (VR1 especially) easy to position. High SPL handling. Frequency range enhancements remove some of the 'classic' ribbon mic flavour. With the RNR1, sE Electronics challenged the ribbon mic norm and extended the intrinsically limited frequency range with some clever design and a Rupert Neve-designed active preamp circuit. Their VR1 and VR2 take the same road but this time with a little voodoo in the physical/acoustical realm, and with a reduction in both size and cost. Like the RNR1 the two Voodoo Range mics present a modern aesthetic that seems to have as much to do with function as it does with a resolute break with tradition - these are no RCA clones. The most striking features are their size and weight, especially the VR1 which has similar dimensions to a flattened Snickers. The VR2 is about 50% longer due to the housing needed for the active (phantom powered) electronics. With regards to mounting, both mics come with a standard mic clip (in the wooden case) and a full shockmount. The design focus of the VR mics is a response (or resistance) to the general acceptance of the high frequency roll off that goes hand-in-hand with the pressure gradient element Vs housing relationship of the ribbon mic topology. Without going into the physics of it (though it's well worth researching), the designer must finely balance the front-to-back dimension which defines the high frequency resonances and the space between the ribbon and the housing grilles which define the structure of the low frequency 'lift' necessary to flatten the response curve. Phew! Alongside this, sE have created a housing and baffle design to combat the high frequency roll off and thus 'extend' the effective range, and that's the bit that has patents attached. The holes in the housing are divided by a solid central section that effectively blocks the on-axis path to the ribbon and, in conjunction with layers of internal baffles and meshes, allows for a response biased towards diffuse (mostly HF) rather than direct (mostly LF & MF) acoustical pressure. The VR1 is a classic passive design and relies purely upon the preamp it is connected to for any amplification. The VR2 joins the new breed of phantom powered ribbon mics that started with the Royer R122 which have been designed for several purposes. Firstly, it stops users being twitchy about the mostly erroneous belief that phantom power kills ribbons. More importantly it amplifies the naturally low output sensitivity of the ribbon mic to a level equivalent to most condensers, thus requiring less pre gain and incurring less noise. The VR mics immediately reveal their extended HF range, especially when placed alongside other ribbon mics. In fact they would stand out less in among a set of condensers. In the majority of cases this difference is positive, though subjectivity is difficult to remove from this consideration. The VRs exhibit the smooth clarity in the lows and mids that is the hallmark of good quality ribbons. In direct comparison, this range response is closer to the Coles 4038 than the more 'mid-forward' Royer R121, both of which we used in side-by-side tests. As the other mics started to roll-off around the 4-8kHz octave the VRs kept comparatively flat for another octave with the characteristic phase-related wrinkles occurring in the upper region of this area. The effect is that, when used as an overhead or room mic, cymbals translate with a little twinkle that has more in common with a good condenser, though without the accompanying upper mid lift. On an acoustic guitar this helps define the picking and strumming transients while still delivering that tricky low mid clarity at which ribbons can excel. The vocal enrichment that comes with the proximity effect (using a pop shield of course) is in full effect with the VRs and is in the same ballpark as the Coles 4038, though without quite the same BBC-voiceover 'chocolate'. The high SPL handling means these mics can get up real close to guitar amps and bring out a rich low end, though in this use, the extended HF range made them seem a little toothless compared with other ribbons we've used in this role (such as Royer and Beyerdynamic). Sonically the VR1 and VR2 are identical, but when the load (preamp) impedance is shifted away from 1200Ω the active Vs passive response starts to become overt. Thanks to the head amplifier the VR2 changes very little with impedance except for a small shift in gain at the extremes. The VR1 shows a more dramatic gain change with relation to load impedance and the resulting frequency response shifts can subtly shape the extended HF range, one of the real benefits of passive mic designs. The output level difference is marked, as one would expect, with the VR2 around 20dB higher. This makes a huge difference in the noise floor and makes the VR2 a very flexible and capable tool for quiet sources. That said, the VR1 is no slouch and has an output level just shy of a Royer R121 and is perfectly decent for work with subtle acoustic instruments. At around £600 for the VR1 and £900 for the VR2 these diminutive modernists are not cheap, but then nor is their performance. They are still priced just below some of the major competition in the same quality range and yet they offer something unique. We are in two minds about the frequency range enhancement as it does, to an extent, remove some of the flavour we expect and rely on from a good ribbon mic, and yet the sound quality is excellent. Of course we can shelve off the HF with an EQ, but that just dulls the source without creating the frequency response wrinkles we know and love. As an alternative to condensers the VRs are a more attractive proposition as they offer a smoother, less 'affected' representation of the source across a similar frequency range. The £300 difference could be put towards a better preamp to make up for the increased noise floor, though obviously it won't buy you a noiseless +20dB! The VR2 is larger and more expensive but it will deliver, whereas the VR1 will be more susceptible to the vagaries of poor signal paths. If you're looking for a new take on the ribbon (or the condenser) the VRs could be your answer, and you can always take advantage of the sE free loan service to find out. To add some extra incentive sE are also including a Dual Pro pop shield and Project Reflexion Filter gratis with each mic purchase before December 31st.